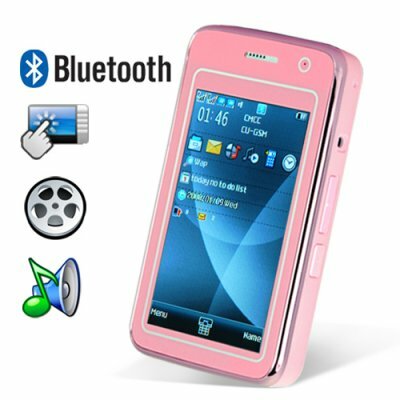 Successfully Added Elegance Dual SIM Quadband Cellphone w/3 Inch Touchscreen (Pink) to your Shopping Cart. Elegance Dual SIM Quadband Cellphone w/3 Inch Touchscreen (Pink). A truly exceptional quadband GSM phone with flawless styling and superb functionality. This is a highly desirable mobile phone presented in a glossy pink exterior with a beautiful chrome pink finish for maximum appeal. A true fashion phone, the Elegance Pink effortlessly combines the luxury of the original, best-selling Elegance mobile phone with a new level of contemporary chic. A must-have fashion accessory like a favorite dress, pair of shoes or fine jewelry, the Elegance in signature pink is the epitome of luxury. A seductive invitation for those who appreciate the finer things in life, the Elegance Pink is a statement of individuality. Blending daring design and great functionality for the style-conscious, this is the mobile companion to be seen with from the office to the gym and on to the evening party. In a world of mobility, turn heads with pure elegance. Coming in a stunning, compact form factor, this is an uncompromising modern phone designed for young women. Fully unlocked to work on any GSM network anywhere in the world, this stylish dual SIM mobilephone works on quadband frequencies (850MHz, 900MHz, 1800MHz, 1900MHz). The two SIM card slots mean that important business or personal calls will never be missed whether driving around town or traveling across the world. With the CVFD-M31-PINK, a world of digital entertainment awaits. With a spacious 3.0 inch color touchscreen, this stylish cellphone provides an unforgettable experience for the senses. Enjoy the full range of a rich digital multimedia provided: capture life through a lens with the digital camera, enjoy the the onboard video and audio (MP3 and MP4) media players for all your entertainment needs, and take advantage of a whole host of other digital media features while on the move. A sleek and intuitive touchscreen interface and accelerometer feature place you in total control of this mobile phone. Designed for the modern young woman who works hard and plays hard, this phone also comes with powerful productivity tools to organize your work, maximize your productivity and keep on top of your active lifestyle. With a modern phonebook and contact manager, stay on top of your social and work life in today's busy world. This fashionable and attractive cellphone would be ideal for any fashion-conscious young woman, it would also be the perfect gift for all discerning young women whether they are a girlfriend, fiancee or wife - or simply a close friend or colleague. As a present for a special occasion or just a thoughtful gift, this mobile phone is for everyone you know who appreciates great design. The CVFD-M31-PINK Elegance Dual SIM Quadband Cell Phone is proudly brought to you by the leader in China Wholesale Electronics, Chinavasion. The successor to the original best-selling Elegance, the Elegance Pink would also be a profitable resale item. Order your stock now and don't forget that buying in bulk will save you even more on the unit price and shipping cost. Just got my phone today!! It took 4 business days to get to Irving, TX. It's cute and fairly easy to use, but I'm still getting used to it. It could use a better manual, but besided that I luv my new phone. Thanks Chinavasion!!! I love this phone, its stylish and fancy and looks very expensive but is very affordable. Fast delievery very impressed. service superrrrr rapide et efficace,merci chinavision.